What's cool about this is the 24 number pattern is absolutely perfect and balanced, much more than what people had imagined. I'll explain that a little bit more on. Anyways, as you move up the fibonacci sequence with any two consecutive pairs, that ratio of those pairs approaches phi (1.618), the golden ratio. However, in MOD9 (Marko Rodin's Quantum Numerology), it creates 24 unique ratios that are not approaching any constant/irrational number. If you take these ratios and apply them to a fundamental frequency, say 256 hertz (a perfect C), you get a full set of 24 unique frequencies. However, many of these frequencies are overtones of each other. Under the column "modified frequency" you can see where I take all the frequencies and their overtones and put them into the same octave of between 256 hz and 512 hz. When you do this you discover only 13 unique frequencies, while the rest are duplicates. With these new frequencies you can make a ratio of them with the fundamental frequency of C256 which creates a unique and interesting 13 note tonal scale. I'm going to rewrite the pattern here with the ratios changed a little to complete the pattern (compare with the set above and you'll see what I mean with the fractions). I've had one friend (ucan on Avalon) play around with them so far and he was rather delighted with the sound. Hopefully someone can make a piece of music from this and see what we can get out of it. Now onto further patterns. The cyclical sequence consists of four 1s and 8s, and two of each other numbers of 2-9 (no 8 obviously). What I noticed is after the first 9, 3 appears twice before the next nine evenly spaced, as so with 6 twice on the latter half evenly spaced. And then it clicked. This furthered Marko Rodin's notion of 3 and 6 oscillating between nine and I realized the true origins of the infinity symbol. In doing so, it inspired me to make a piece of art which the clever mind can easily decipher. Enjoy! You can create a triangles inside each circle of the infinity sign if you connect the trinity numbers (3,3,9 & 6,6,9). Now if you look at the symbol, you will see that each number in one of the circles is the exact opposite of the other when in relation to Marko Rodin's circle of life. 9 stands alone as the central axis. 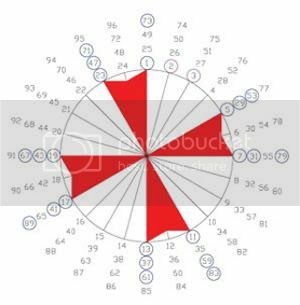 Now if you take the circle of life and connect the 24 number fibonacci sequence in sequential order so you draw a line from a 9 to a 1 (technically you pause on the 1), to a 2 to a 3 to a 5 and so on it creates a perfect symmetrical image. It's interesting in that 4 and 5 are the only consecutive numbers that do not connect. If you do a diagram with just the first 12, then the second 12, they create opposite mirrors of each other. Now if you connect the fibonacci numbers in a different technique by adding each one to the next (so it starts at 0, goes to 1, then 2, then 4, then 7, then 3, always going clockwise on the circle) instead of connecting to the actual number, it also creates the same perfect symmetrical image. However, this one does not line up on the nine axis, but instead it points to the eight (shifted to the left one step) but it still ends and starts on the nine. Metaphysically, this shows the roots of how the yin and yang, masculine and feminine energies came from in how energy fields on a basic level oscillate. Marko Rodin talked about this but outside of his simple number patterns, I am not sure if he discussed this. Last edited by GregorArturo; 01-14-2009 at 06:22 AM. Last edited by Anchor; 01-14-2009 at 12:04 PM. Thanks Anchor. I've been through that site a bit already. Thanks for sharing though! so is that how you think rodin got his 339669 pattern from? "We are a modulation of sound. The DNA is pure sound matrix and modulates time. We experience time by the way that the antenna of the DNA goes through its own metabolism. The metabolism, the 64 codons and the permutations of that, 6 x the hexagon of the 64 codons creates 384, which is exactly 384 days for 13 lunar months." Hence, this is a cross coding of the multiplication of 64 and four times 432. The capstone of the Great Pyramid fills the Great Pyramid exactly 384 times, volume to mass. 384 = six times the 64 codons of the DNA, recall. It is an exemplary function of sound technology. In fact the Great Pyramid is a perfect sound chamber. It has 44 harmonic octaves that are phase-conjugating and are going inside and outside in sound, that are arranged in PHI, sound to light." Last edited by alchemikey; 01-14-2009 at 09:05 PM. The non-linear double octave (if you know what I mean) will be much easier to play on standard midi instruments, I'm looking forward to having a real play with these - I can at least use them for a textured landscape of sound, but the more we play with things the more we learn about them and sharing is as important as discovering, thank you - I'll modify my code to include the next 11 notes as well - keep up the good work friend, much appreciated. Thanks ucan! You can program the other 11 notes but they are just octaves of the other 13. You could try playing around with all 24 original frequencies, and you don't have to do it off of C256 (could use 128 hz for example as a base). Maybe just making a 24 beat soundtrack with them in sequential order on loop. Hmmm? Mikey thanks for sharing the piece about the pyramid. Interesting with 432 and 384. They are very meaningful numbers [to me at least already]. And you beat me to it! I was coming on to post that crop circle and explain how it is littered with Fibonacci all through out it! You can count the steps in MOD9 and base ten with it! 55 circles in all. 21 circles on either side. Now applying this to physics, it makes me wonder about the double use of one above and below the nine (as above, so below haha). Makes one think that the central axis consists of 1,9,1 which reminds of the Seal of Solomon. Also with the circle inside the central circle represents the fractal nature of reality, the ancient symbol for the sun. 55th term of Fibonacci sequence is 139583862445 which can be reduced to 55 = 1 + 3 + 9 + 5 + 8 + 3 + 8 + 6 + 2 + 4 + 4 + 5 = 58 = 13 = 4. There are a total of 55 circles in the crop circle. If you include the one in the center made of the 8, plus the 2 made by the infinity sign you get 58. 55 is also the number in terms of Gemetria for the 'devil'. 55 is the 11th number in the Fibonacci sequence. However, if you exclude the zero (which is represented as a 9 in MOD9, and technically should be the 24th), it becomes the 10th. And last but not least, it shows the toroid structure of the universe. 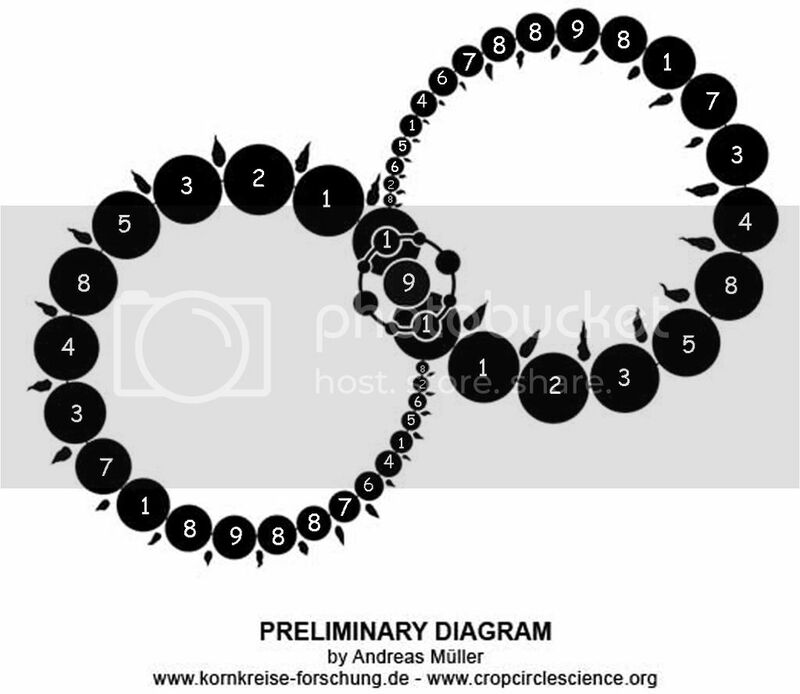 So, it makes me wonder does each circle consist of 24 steps or 12 steps, and if that part of the circle contains 11 steps (as to my design) or 21 (as to the crop circle which would take the triple axis away from it), if you get where I am going with it. My way makes more sense in that nine is always the central axis, which has already been put forward by several others. Also, that puts 11 steps to either side of the axis, which makes 22, or 22 archetypes to the tarot, as if the soul experiences a different piece of the sequence, but starts before it as the 9, and ends it as a 9. Also, the first 9 would be a zero, the second would be 144 (which relates to the whole code144 with Coral Castle), and the third is 46368 (which has its own little patterns in itself). 144 is also the square of 12. This would make be assume that 1 is really the first number of the sequence, not zero/nine, as this all begin with one (law of one), not zero, as 144 would be the 12th number in the sequence. That 12th position would also equate to 3 in MOD9. The 24th Fibonacci number is 46368, which equates to 9 in MOD9, and 24 equates to 6 in MOD9. The 36th number is 14930352, which is also 9 in MOD9, and 36 is 9 in MOD9. 36 is noteworthy as from what I gathered is energy seems to spiral outwards in 36 directions, as also seen with Marko Rodin's toroid. And Mikey, did you create that image yourself, as in you thought of it after looking at my pic? Just cause I have seen one single mention on this entire internet of Rodin acknowledging Fibonacci was a 24 number sequence (I did find this out on my own though :-p), and that wasnt from a document of his (someone working off his work). He also mentions in his 4 hour lecture that pi is a whole number, which I am assuming is 3? but would like it explained. Hopefully I can figure that out next. Anybody know what an alternating 4,4 means in the central circle, cube laying over another cube? I am still also puzzling about the little tail/tear things, pointing inwards on the right, outwards on the left. What is most interesting is the left counts 21 tears, the right 22, which makes 43 in total. This is the most puzzling part to the formation otherwise. Mikey thanks for sharing that! I'm gonna sit back and check out his site for awhile. It made me realize that the Fibonacci sequence operates in a two part sequence. If you look at my drawing, the nine separates into two parts, first being one and eight, that being for the formless to form (nine, but technically also zero!) it much divulge into balanced forms. So the two directional particles (?) oscillate in between each other expanding outwards from nine and collapsing back into itself. One of the oscillations focuses on 3, the other 6, and then they flip flop with each other. This made me realize the importance of base nine with whole numbers, base ten with decimal system (Mayans used base 20, both work for the most part the same), and base twelve with growth and physical reality. What made me think was interesting to, the first spot on the infinity loop technically is your nine (spirit), but in physical manifestation is the one, which would equate to hydrogen. The first on the next loop would be aluminum, which is 13 (4 in base 9, 1 in base 12). This also sheds more light on the significance of 13, as with the Mayans. If you take the sum of the first 12 digits of Fibonacci it equates to 52, another sacred Mayan number. The second set equates to 65, totaling 117. However, if you add each opposite with itself, and apply MOD9 (which really only affects the double nine with 18), it comes out to 108 (9x12), another sacred Mayan number, and also related to Vedic and Tantric traditions (repeating Mantras that many times). Here's a chart adding the sums together of all the sequence so far, one for base nine, the other for base ten. Basically these numbers are all one less than the Fibonacci numbers in both number systems. 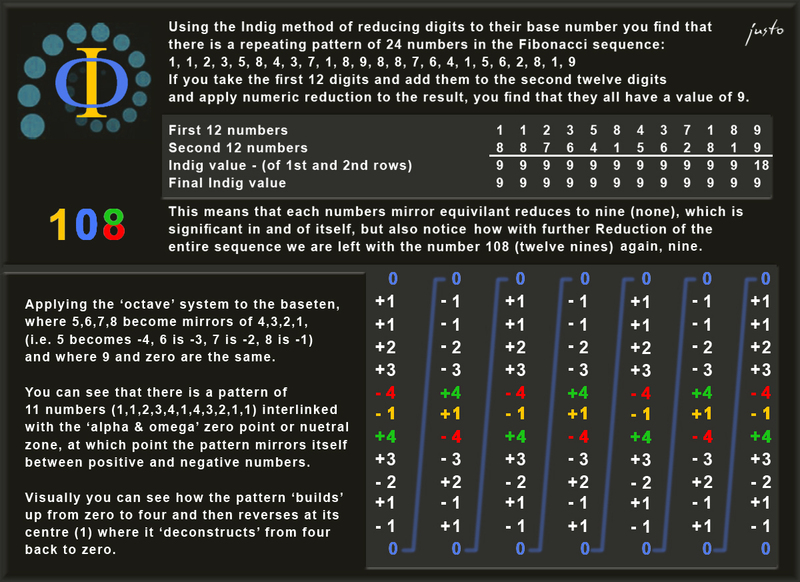 Base nine has both 24, the total steps in MOD9 fib, and 34, is the 8th fib number in the base ten sequence. Base ten has 33 (christ consciousness, 33 hz) and 54 (also relates to 108, exactly a half), more significant numbers. Then both obviously share 1,4,7,20, which are all very interesting significant numbers. What's most interesting is it shows some correlation with the 20 and the Mayan calendar. Again though with number 13 (4 in base nine), its sum total is 24 in base nine, and 33 in base ten. So in my opinion, to truly understand the 2012 phenomenon we need to really take Fibonacci apart completely. Hopefully this website Mikey shows will shed some light on it for me at least. Decided to play around with powers today and I came across that each power set repeats every 9 numbers except for 3 and 6, which repeat every 3 numbers. The more interesting thing is the at the 8th power, it starts again with the same pattern as the power of two. At the 14th power, the pattern repeats again, following the same repeating the same six sequences. Only the first power, consists of its own unique pattern, that being the simple linear one through nine. However, if you also consider the power of zero, it always equates to one. Now what this means metaphysically is that their really are eight dimensions. The first dimension, or technically zeroth dimension, is that of pure consciousness, the singularity. For it to manifest into reality, it needs to take some form, that being either the first to seventh dimension. This all then ties in with the seven densities and seven chakras. And that the 8th density, is the return back to infinity (sideways 8). And infinity in itself, is a single concept, that can be represented up simply by one symbol: ∞. So I just did the opposite with the powers, with playing with the base number. Marko Rodin shows us the doubling technique which is a 2^X function. Here is a graph with the functions 2^X through 9^X. After 9, 10 repeats the cycle obviously. Both 10 and 1 in MOD9 function always equals one. Now if you ignore the first row, which is X^0 power (always equals one), and start the pattern from the second row, X^1, everything has a mirrored pattern. 1 with 9, 4 with 7, 2 with 5, 3 & 6 (This is the only pattern that is slightly different stlye pattern but a mirror nonetheless), while 8 is the only number who does not have a mirror with the 1 & 8 repeating pattern. Interesting thing is, a complete 2D matrix in base 9 consists of 81 units too (9^2). I do not know what the uniqueness of this eight means metaphysically but only seems to reinforce what I previously said about eight with infinity and the density. 1 and 8 though are the two numbers that oscillate with each other in the Fibonacci sequence. The 4 and 7 base powers form triangles when drawn out in the circle of life (Marko Rodins MOD9 circle with the numbers 1,4,7). The 2 and 6 base powers form the infinity sign in the circle of life (as normally seen in his traditional picture). The interesting thing here is if you drew the number sequences for each power on the circle of life. The entire image would all be perfectly symmetrical down the central vertical axis except for the 1,4,7 triangle which throws it off. This is rather peculiar. 1,4,7 are also 3 numbers that are all part of the Fibonacci total sum I already shared about. Someone posted this on code144 in response to what I posted and makes 144 all the more significant if it plays out right. Anybody has done some more research on the visual end of these dynamics? I'm about to dive into that but I'm not a fan of maths so any leads would be greatly appreciated. Listen to this progamme again in full above-Melvyn Bragg-"In our time". 1, 1, 2, 3, 5, 8, 13, 21, 34 … this is the beginning of the Fibonacci sequence, an infinite string of numbers named after, but not invented by, the 13th century Italian mathematician Fibonacci. It may seem like a piece of mathematical arcania, but the Fibonacci sequence is found to appear, time and time again, among the structures of the natural world and even in the products of human culture. From the Parthenon to pine cones, from the petals on a sunflower to the paintings of Leonardo da Vinci, the Fibonacci sequence seems to be written into the world around us. Some of the viewers comments are quite positive on this programme. Last edited by Antaletriangle; 02-16-2009 at 11:18 AM.